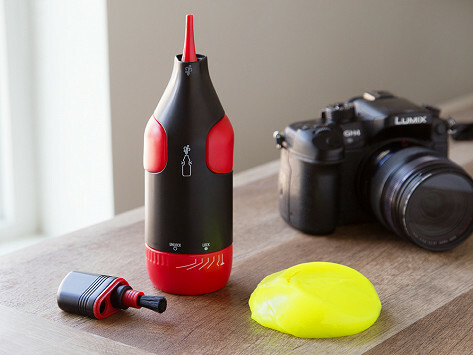 This camera cleaning putty squeezes into the crevices of your camera gear to keep it like new. It also includes a cleaning brush, lens cloth, and air pump so you can deep clean your equipment in a flash. Dimensions: 2.2" x 2.2" x 7.5"
This was a Christmas gift. I purchased this as a gift for my grandson who received a really good camera for his birthday. He needed something to take care of the cameracamera and this is the perfect thing. This clever, satisfying-to-use putty squeezes into difficult-to-reach areas, attracting dirt and getting rid of 99% of germs. Clean the in-betweens of your keyboard, the corners of your dashboard, the buttons on your console, even your camera gear. There are different formulas for different cleaning endeavors. There’s a Cyber Clean for electronics, keyboards, and the inside of cars (think: dashboards and cup holders), another gentler formula for plants, and one to keep your camera gear dust-free. This putty also changes color to let you know when it’s ready to be replaced, and molds and contorts like other cleaners can’t.